UDM Downloads > VideoCap ActiveX Control ( Video capture ocx )! 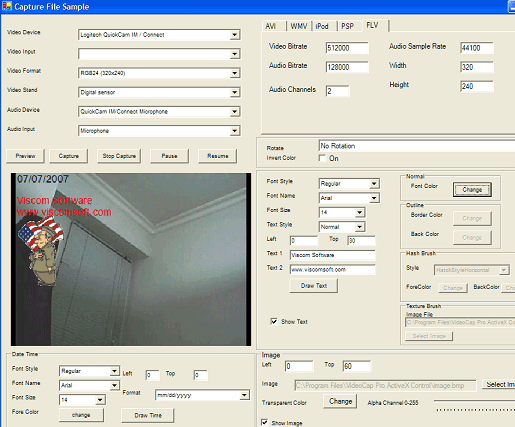 Capture Video/VCR/TV Program to AVI or Streaming file format (WMV file). Capture Video From web cam, capture card, TV Tuner to AVI or Streaming file format (WMV file). Capture Video stream From IP Camerea. Frame grabber to memory or clipboard. Refresh audio pin when audio device changed. Detecting insert or remove USB device. Support TV, FM Radio, AM Radio, Digital Satellite Service TV Tuner. Adjustment display area, e.g. full screen or user define size. Support Custom WMV Profile. You can configure streams to use Window Media Video 9 Codec, VBR and CBR bitrates, uncompressed audio or video stream, Video Size, Buffer Size, Frame rate, etc. SnapShot Bitmap, JPEG from TV Tuner Cards, Web Cams, Capture Cards. SnapShot in Memory (HBITMAP, Picture Box) from TV Tuner Cards, Web Cam , Capture Cards. Support AGP Capture cards, e.g ATI All in Wonder Series. Single frame and image sequence capture. Video Compressor setting including DivX, XVid, WMV. Programmatically control Video Standard (Pal and NTSC). Camera Control from selected video source (e.g Brightness, Contrast). Real Time Video Preview. WDM Streaming Device Selection and Setting. Video/Audio Capturing. Include Access, VB, VB.Net, VC++, VFP Sample Code. Compatible with any programming language that supports ActiveX (Access, Visual C++ , VB.Net, c#, Visual Basic , Visual Foxpro, Delphi, .Net, etc.) Royalty free distribution of the OCX file. Support win vista, 98, me, 2000, xp.